It's a divine "incidence" and not a "co-incidence" that on the very day that I have finished reading Aravind Balasubramanya's book, "Memoirs of a Sai Student" THRICE, I get an email from Brother Aravind, sharing details of the book release of the sequel titled, "Capturing Divinity." I am so happy to know this because I enjoyed reading Aravind's earlier book. He writes with sincerity and a great sense of humor. The way he writes captivates your heart because he goes into the tiny details of Swami's personality and his own and does a fantastic 'Bhakti-mapping' too! 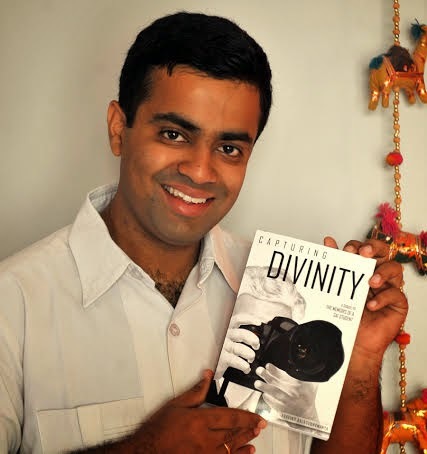 "Capturing Divinity" has been released and can be bought from the Sathya Sai Bookstore. The ebook will be arriving very soon. You can also write to orders@sssbpt.org to order your copies.. If any queries, please write to enquiry@sssbpt.org. My wife and I have just read Divine Memoirs of a Sai Student and can't wait for the ebook release of the sequel. Tears of nectarine bliss reconnected us with our beloved Swami as the riveting narrative embedded in deep spiritual wisdom challenged our modes of thinking, speaking and acting. Aravind's honest reflection and willingness to analyse his behaviours in a candid and authentic manner is inspiring. May Swami bless you dear brother to continue to inspire His devotees. With profound gratitude and love. @Aravind: Dear Brother Aravind, thank you for the kind words. You are doing Swamis work and I am overwhelmed by your devotion to Swami, thanks again. @Sagie Thanks for sharing your thoughts here...I agree about the book...it's full of honesty and Bhakthi...Swami often says it is the "Bhav" or the emotional intent that matters most and Brother Aravind brings the Bhakti bhav most beautifully in his writings...I too wish him all the very best.